Welcome to the Petaluma Area Pilots Association‘s website. 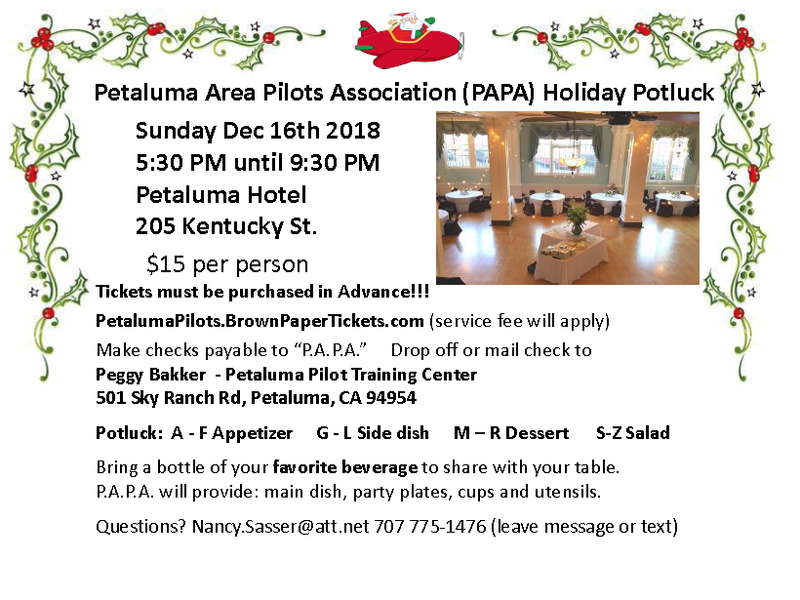 PAPA is a group of pilots and friends of the Petaluma Airport [o69], in Petaluma, California. Formed in 1978, PAPA holds monthly meetings, sponsors monthly Display Days for antique and classic aircraft, hosts educational seminars, and provides aviation-related scholarships. It’s an active group of pilots that live, work and fly in the Petaluma area. Join us at one of our upcoming activities and see why this is such a great place to fly! “One mile of highway takes you one mile. Comments Off on Welcome to PAPA Online! Bring a bottle of your favorite beverage to share with your table. P.A.P.A. will provide: main dish, party plates, cups and utensils. Comments Off on PAPA Christmas Party!!! and help support the scholarship fund too.